Our Feb 6 performance as part of the 29th annual E Kanikapila Kakou concert series on Kaua`i was our fourth or fifth time in that Garden Island Arts Council annual event. It was the best ever. I recall that the first couple of times we were honored to be in that program were many years ago in a school cafeteria. We also performed an EKK concert at other venues and last year and last week, we enjoyed the Jasmine Ballroom stage in the Kaua`i Beach Resort … performing to a full house, hundreds of Hawaiian music and hula fans. For an hour before the concert, Frank conducted a pakini workshop again; Carmen taught a hula workshop for about 25 ladies, and I had about 50-60 `ukulele players in my workshop, learning to sing Hawaiian songs (phrasing, pronunciation, meanings, translations, researching, etc.). In the two-hour concert, we shared some old traditional songs, some of our own compositions and translations, and nine of the 25 ladies who had just learned to dance “Puamana” joined Carmen in that hula. There was a double booking and we gave up our 2/21 concert in Kane`ohe to our good friend, Connie Kissinger, who is home from Chicago. 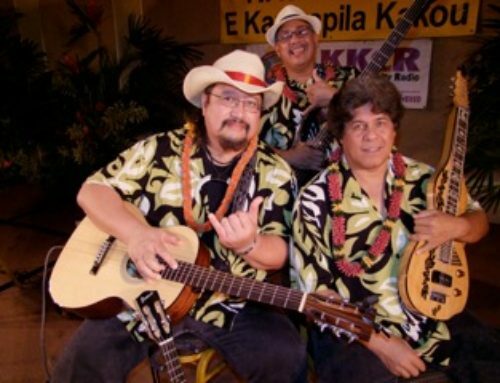 We’ve rebooked and will do our next Kane`ohe concert in that Ruth Bacon Auditorium on March 27. It’s FREE and you are all invited. Frank, Ron, Carmen,Keith at Waimanalo. KFC will perform a concert in Hilo on Friday, July 20, and stay there for the weekend to enjoy our perennial `ohana Kauaua family reunion on Saturday and Sunday, July 21 & 22. Stay tuned for particulars on that Big Island concert. Our last performance on Hawai`i was to an SRO audience in 2008 at the Volcano Arts Center. As you many know, the `Ohana Kauaua is probably the largest family in the Islands with about 5,000 family members. We hold the reunion every two years and rotate around the Islands — two years ago it was on O`ahu; two years before that it was on Maui; and so on. The Big Island is always special because that is where Carmen’s many times great-grandparents — Keli`ionahuawai Kauaua and Kaua`iokalani Kanae — were born The family descends from their five children; Carmen from the Apuakahei line. 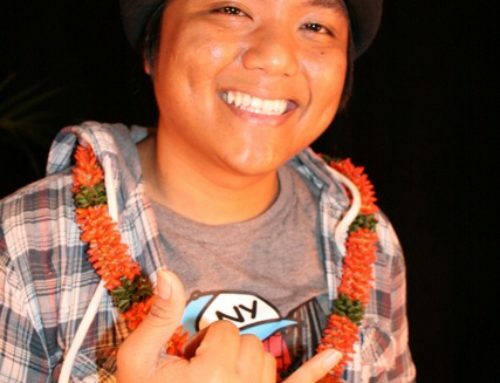 And some Big Island singers — The Lim Family, Led Ka`apana, Diana Aki with Cyril Pahinui, and Brittni Paiva with Melveen Leed — have recorded and helped to popularize some of Keith’s Hawaiian compositions. 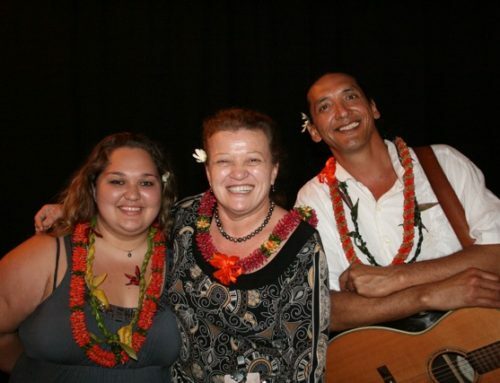 This photo was from our recent concert as part of the 2012 E Kanikapila Kakou concert series on Kaua`i. We conducted workshops (Carmen – hula; Frank – pakini; Keith – singing Hawaiian language songs) and then put on a two-hour concert to a full house in the Jasmine Ballroom of the Kaua`i Beach Resort. It was a wonderful, heart-warming evening with a super audience. We share some old, traditional songs; some original compositions; some translations; and some beautiful hula. Nine of the 25 women who attended Carmen’s workshop came up to dance with us during the show. Another date you should mark on your calendar is Saturday, June 16, when Keith and Frank will perform a concert in the Atherton Performing Arts Studio at Hawai`i Public Radio. More later. It will be a unique concert, like nothing you’ve ever enjoyed before. TCHQ will also produce and perform in the 6th annual Peace on Earth concert on Wednesday, June 27, with a wonderful lineup of local talent. More later. Once again, it will be a biggie. Here’s the cover of last year’s concert, when multiple Grammy and Na Hoku winner Dennis Kamakahi was the main attraction. In our opinion, Dennis is the best Hawaiian lyric composer of our day, in a league with Queen Lili`uokalani, Charles E. King and Johnny Almeida. We can’t count the number of shows in the past 40 years that we have opened with Kamakahi songs…they work. Here’s Dennis at last year’s Peace on Earth Concert. Carol Yotsuda, who has been presenting two months of Monday night E Kanikapila Kakou concerts on Kaua`i each Feb-Mar, is an awesome leader of the Island’s art and culture community. She’s a mover and a shaker, an outstanding artist, and so much more. Kaua`i and all Hawai`i is lucky to have her. We thank Carol again for including KFC in the E Kanikapila Kakou concert series.